A Christian mother from Eritrea, one of the most repressive countries in the world, has opened up about the challenge of teaching her children in the faith while warning them to keep it a secret from authorities. The mother, who was identified as "Ruth" in an Open Doors USA interview published on Monday, said that her husband, a church leader, is in prison. "I was born into a Christian family. But in 1994, when I was in my teens, I entered into a personal relationship with Christ and started following Him wholeheartedly. At the time of my salvation, the church in Eritrea still enjoyed freedom, and wonderful things happened. Many people got saved, and there was great joy. Since then, I have come to know what it is to worship God in freedom and in secret," Ruth explained. The mother did not identify her husband, but said that he was sent to prison after the government closed their church along with other independent churches. She talked about how "unbearable" it is to see their three young children grow up without him. 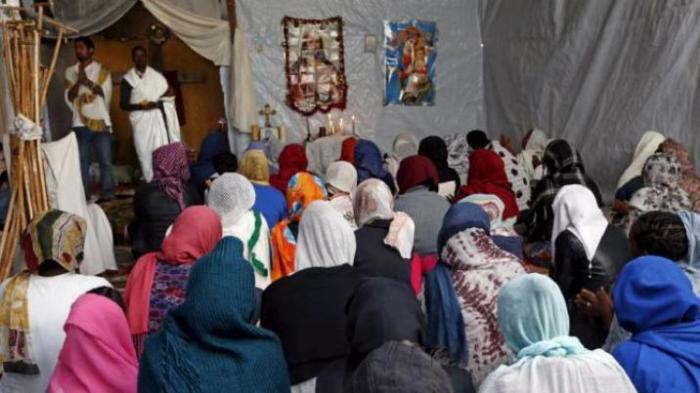 The woman noted that Eritrea allows certain recognized churches to operate, but those who choose to worship outside the state-sanctioned groups are persecuted heavily. She noted that children who do not have baptism certificates from one of the recognized churches are not able to access food coupons or any other public services and thus, independent Christians can be easily identified. Open Doors pointed out that Christians in the African country are often accused of being "agents of western imperialists" and "haters of the mother-land." But all the believers want to do is worship God, Ruth stressed. "We are peace-loving people who want to worship God in peace. We are normal people of faith. As Eritrean Christians, we love our country. Being a Christian is about a relationship with God. We do not have any political agenda. All we want is to worship God in freedom," she said. Christians not only face pressure from the government but also from society, she added. "They can't wait for us to be caught worshiping in secret. In our neighborhood, we constantly face pressure, so we go about our everyday life with caution and fear," she said. This forces her to teach her children the Gospel behind closed doors. "They are too young to understand what is going on. They want to sing loudly and share what they learn at home with their friends at school. One day, security officers visited my house, and one of my children kept singing gospel songs! I had to run and cover her mouth with my hand. It is so hard to teach them the gospel and at the same time tell them to not say anything to other people. This is very confusing for them," she detailed. Ruth pointed out, however, that Christians expect to suffer for the Gospel. "The love of God is stronger and compels us to worship Him despite the dangers. We know there is a risk but because of our love for the Lord, we cannot stop worshiping Him. We cannot stop praying to Him because we need Him to overcome our difficulties," she said. The Eritrean government has arrested both small church leaders and big names, such as Patriarch Antonios of the Eritrean Orthodox Church. Christians in September vowed to pray for Antonios, who was removed from office, in violation of canon law, and has been held in house arrest since 2007. U.K.-based Christian Solidarity Worldwide said Antonios has been targeted for objecting to government interference in ecclesiastical affairs. He made an appearance in public at a church service on July 16, his first since 200, but CSW argued that he was allowed to appear only to offset international criticism and pressure.